This supra alternating pressure overlay is the first step in bed sore and prevention and healing healing. This hospital air mattress can be placed over a hospital bed frame or twin size mattress. It is also designed to conveniently attach to any standard healthcare mattress. This hospital air mattress uses alternating pressure and low air loss therapy and offers 20% more air cushion and flotation than the standard models. The low air loss feature is built into the mattress to help keep the patient dry and cool. This alternating pressure overlay was used when the patient transitioned from the hospital to home care therapy. It is extremely cost effective and offers more comfort, protection, and healing properties than the standard alternating pressure pad systems usually prescribed from the hospital. This alternating pressure overlay can be used as a long term care mattress or used when needed to treat and prevent pressure sores. This supra alternating pressure overlay is the first step in bed sore and prevention and healing healing. 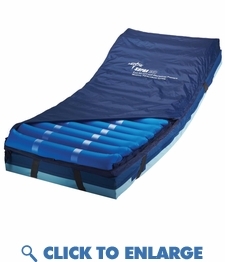 This hospital air mattress can be placed over a hospital bed frame or twin size mattress. It is also designed to conveniently attach to any standard healthcare mattress. This hospital air mattress uses alternating pressure and low air loss therapy and offers 20% more air cushion and flotation than the standard models. The low air loss feature is built into the mattress to help keep the patient dry and cool. This alternating pressure overlay was used when the patient transitioned from the hospital to home care therapy. It is extremely cost effective and offers more comfort, protection, and healing properties than the standard alternating pressure pad systems usually prescribed from the hospital. This alternating pressure overlay can be used as a long term care mattress or used when needed to treat and prevent pressure sores. Overlay has 5-inch air cells that help provide 20% more air cushion than 4-inch competitor models, which enables better flotation. Overlay is designed for patients up to 300 pounds. Pump alarms to indicate low pressure. Air cells and top cover are replaceable. Low Air Loss Alternating Pressure Therapy Overlay System.